A hiatal hernia occurs when the upper part of the stomach pushes through an opening between the lower esophageal sphincter (LES) and the diaphragm, up into the chest. The hiatus is an opening in the diaphragm which is the muscular wall separating the chest cavity form the abdomen. Normally, the esophagus passes through the hiatus and attaches to the stomach. In hiatal hernia, the stomach bulges up into the chest through that opening. There are two main types of hiatal hernias-sliding and paraesophageal. In a sliding hiatal hernia, the stomach and a section of the esophagus slide up into the chest through the hiatus. This is the more common type of hernia. The paraesophageal hernia is less common but more dangerous. The esophagus and the stomach are in their normal positions but part of the stomach squeezes through the hiatus and lands next to the esophagus. There is a risk of the stomach getting "strangulated" or having its blood supply cut off. Often people with hiatal hernia also have GERD. The way the hiatal hernia contributes to GERD is not clear. Two theories have been put forth. 1) When hiatal hernia is present, the LES slides up into the chest while the diaphragm remains in its normal position. The diaphragm and the LES rely on each other to keep the stomach contents from backing up into the esophagus. With a hiatal hernia, the ability of the diaphragm to help the sphincter is seriously hampered. 2) A valve-like tissue at the junction of the esophagus and stomach just below the sphincter normally prevents reflux. The esophagus enters the stomach tangentially so that there is a sharp angle between the esophagus and the stomach. The thin piece of tissue in this angle forms a valve that can close off the opening to the esophagus when the pressure increases in the stomach. When the gastro-esophageal junction and stomach are pulled up into the chest with each swallow, the sharp angle where the esophagus joins the stomach becomes less sharp and the valve-like effect is lost. 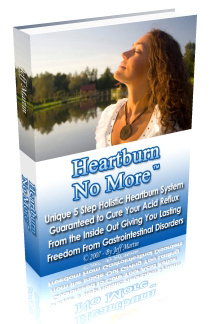 Both these changes promote reflux of acid and GERD. A hiatal hernia by itself rarely causes symptoms. Those who do experience symptoms, the pain and discomfort are due to the reflux of stomach acid and bile into the esophagus. The symptoms could include heartburn, regurgitation, and vomiting, sour or bitter taste in the mouth, frequent belching, and hiccups. Symptom may be relieved by making simple lifestyle changes. · Eat smaller, more frequent meals. · Avoid foods, caffeinated and alcoholic beverages that may cause acid reflux symptoms. · Do not eat within three hours before going to bed. · Elevate the head of your bed 4 to 8 inches with the help of bricks or blocks or use a wedge pillow. · Avoid tight clothing around the stomach and waist. · Do not bend or stoop after meals. · Avoid lifting heavy things. All these changes can significantly improve the medical condition of GERD and hiatal hernia sufferers, but cannot cure the disease. A holistic approach which involves the physical, mental, as well as the emotional aspects of the body is the only way to treat both GERD and hiatal hernia.